Railfuture Scotland's Autumn 2018 meeting took place on Saturday 3rd November at 13:30 at Quaker Meeting House, Victoria Terrace, Edinburgh. The guest speaker was Iain Budd, Chair of the Friends of the Far North Line about life on the most northerly railway line in Scotland. The cropped photo shows the speaker (standing) and some of the audience at the front. He showed wonderful pictures of the empty landscape in the Flow Country through which the train passes, and of tiny lonely stations including Kildonan Castle, built specially for the Duke of Sutherland who helped to get the line built. Other pictures showed the variations of weather the line was subjected to, including several feet of snow, which was commonplace. On one occasion many years ago, most of the train was derailed by snow and 70 passengers had to spend a cold night in one carriage before they were eventually rescued by helicopter! Ian emphasised that what would be minor deficiencies on a busy Central Belt Line, such as one member of staff being off ill, could have a huge effect on such an isolated route. He brought some copies of the FoFNL magazine, which won a Gold Award for Best Newsletter at the 2017 RUG Awards organised by Railfuture. Railfuture Scotland's Spring Meeting and AGM in Edinburgh was held on Saturday 21 April 2018 at the Jury's Inn, Jeffrey Street, Edinburgh, Edinburgh EH1 1DH. The guest speaker was David Shirres from Rail Engineer magazine. Railfuture Scotland held its Autumn 2017 meeting on Saturday 14 October 2017 at the Friends Meeting House in Edinburgh. The speaker was Alex Hynes, Managing Director of the ScotRail Alliance. 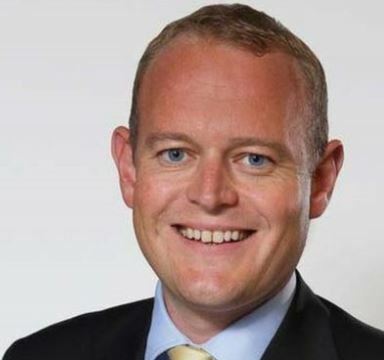 His role is to "lead the delivery of Scotland's Railway through the ScotRail Alliance, a unique and industry-leading partnership between Abellio ScotRail and Network Rail Scotland." As a thank you for giving up his afternoon, Mr Hynes was presented with a copy of Railfuture's new book Britain's Growing Railway (see[SHOP] to buy the book and find out more about it). Railfuture Scotland held its Autumn 2016 meeting on Saturday 1 October 2016 at the Friends Meeting House in Edinburgh. 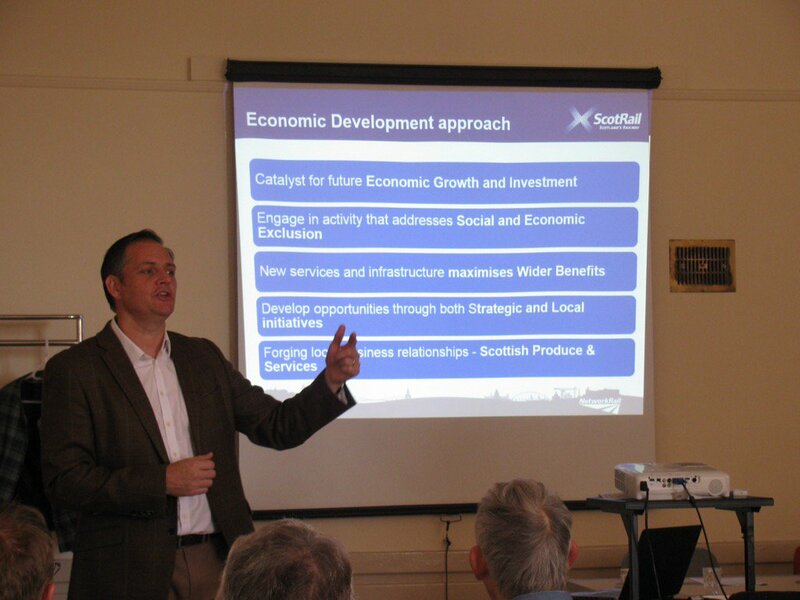 The speaker was James Ledgerwood, Head of Economic Development, at Abellio Scotrail. 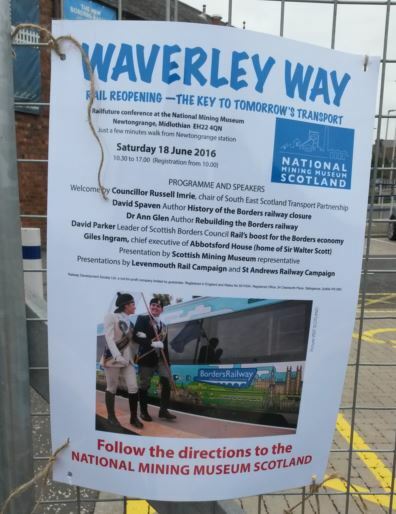 Railfuture Scotland hosted the national summer conference at the Scottish National Mining Museum, Newtongrange, Midlothian, EH22 4QN, on Saturday 18th June 2016 (photo of notice at station by Jerry Alderson). About 80 people attended. The location had been specially chosen as it is located along the Borders Railway, which will reopened on Sunday 6th September 2015 after more than 46 years since its closure on 6th January 1969. Like all of Railfuture's all-day conferences, it included welcome drinks and a buffet lunch. A list of the national conferences, including those held in Scotland, can be found at www.railfuture.org.uk/conferences, which also takes online bookings for future conferences. For photos of the Borders Railway click HERE. The Borders Railway reopened (after 46 years since closure) on Sunday 6th September 2015, with the official opening by the Queen on Wednesday 9th September, the day she was due to become Britain's longest serving monarch. 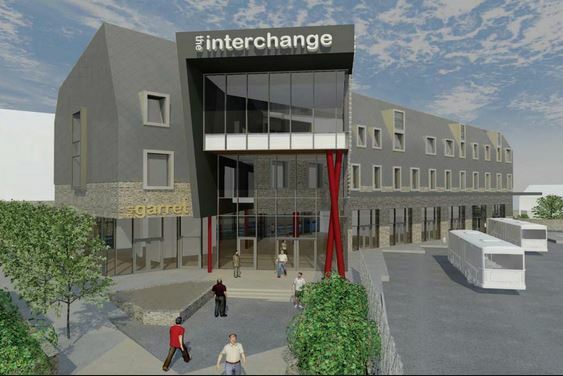 Railfuture Scotland organised an event for its members and the public later that month (on Saturday 26th September) at the new Transport Interchange at Galashiels, towards the southern end of the reopened line. The guest speaker was Dr Ann Glen who talked to the packed audience on the subject of "Re-Building the Borders Railway", which is the subject of her new book. Dr Glen had followed the rebuilding process from day one and had managed to enlist "inside" assistance from key Network Rail personnel which enabled her to take photographs from privileged sites. She showed some of these during her presentation. In addition she had acquired information about the snags encountered by the engineers and she was able to relate these to her audience with both humour and passion. One attendee from Railfuture's North East branch said "Without doubt this was one of the finest presentations I have ever heard at a Railfuture event. 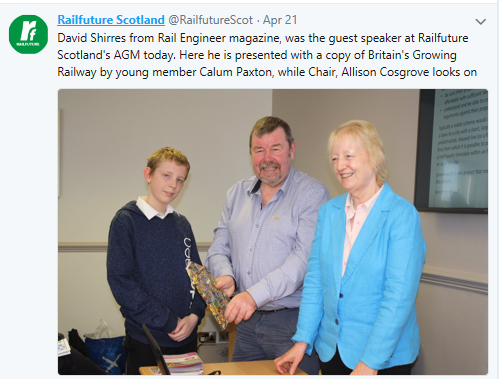 Congratulations to Railfuture Scotland for mounting such a successful and enjoyable meeting." Railfuture Scotland with CRAG and RailQwest held a meeting on Saturday 17 November 2012 from 14:00 to 17:00 at the Friends Meeting House in Edinburgh. Lawrence Marshall and Bill Forbes led an open discussion on "Lobbying West and East". 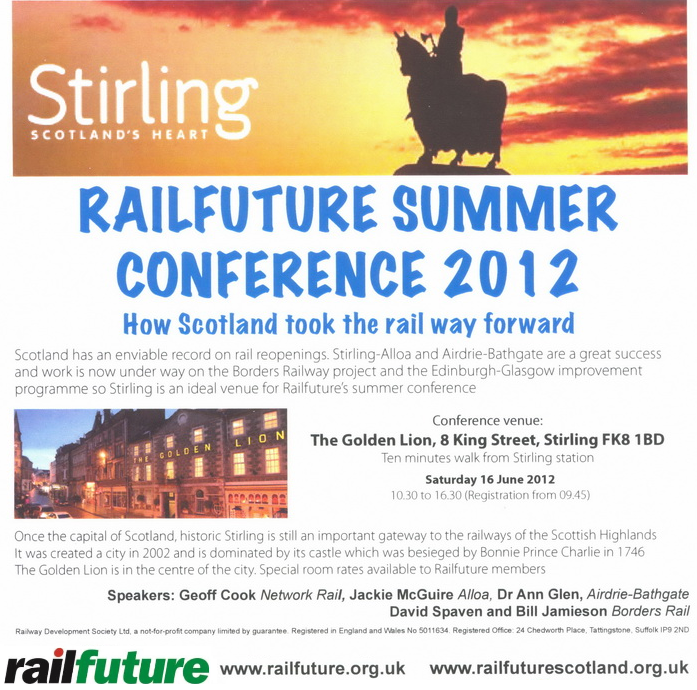 On 16th June 2012 Railfuture Scotland organised the national summer conference, which was held in Stirling. 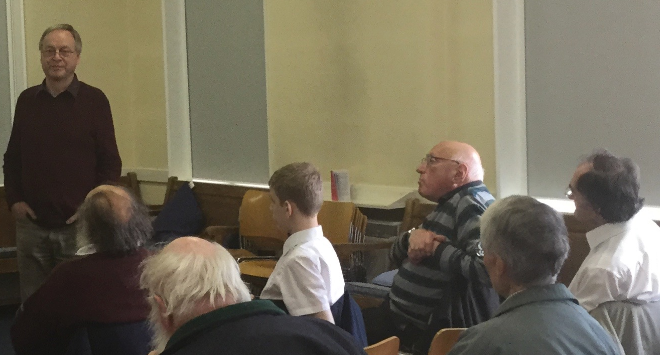 More than 40 people listened to speakers that included Network Rail and experts on some recent railway reopenings. The confernece showed that England had a lot to learn from Scotland when it comes to re-connecting communities to the national rail network. Railfuture issued a press release immediately after the conference entitled "Rail Campaigners want to copy Scottish rail successes".